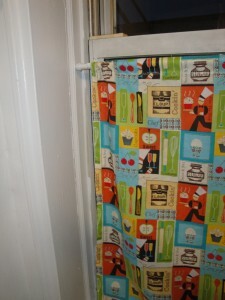 This was originally intended to be a tutorial about how to make your own cafe curtains, and it still is, but it’s also a lesson in problem-solving. I don’t think I’ve ever had a sewing project where I didn’t make at least one mistake along the way. 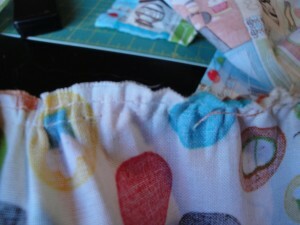 Those are the Make It Work moments, and there is something kind of satisfying in problem-solving a sewing disaster. The ultimate width of your fabric will depend on how full you want your curtains. My mistake was making the width only 1 inch bigger than the width of the window, and that’s where I went wrong. Some patterns say to cut the fabric twice as wide as your window, but it really depends on your preference. 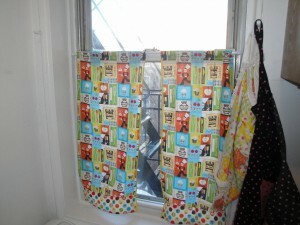 you can hold your fabric up to the window and use your judgment. 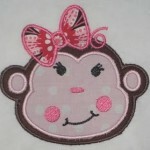 For the ruffle you want it 4.5 inches and the same width as your main fabric panel. Make sure it’s straight. A crooked curtain will annoy you forever. Hem both sides of your main curtain fabric and both sides AND the bottom of your ruffle. 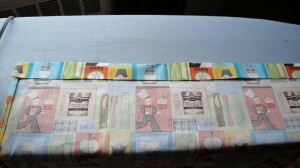 You’re making a narrow hem here, so you fold the fabric over 1/4 of an inch – press it. 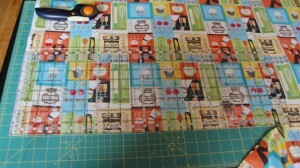 Then fold that over 1/4 inch to hide the raw edge and press that. Put a few pins in to hold it. Stitch it. Fold the top raw edge in 1/2 and inch and press it. Fold it over again however wide you need for your rod (1 inch in my case). Press it. Stitch it. I did a little zig-zag stitch here because I thought it might look nicer. 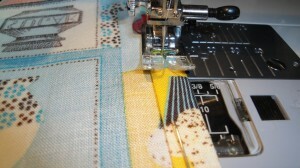 Set your machine to the longest stitch length. Put the ruffle and the main fabric right-sides together. Stitch 1/4 inch from the raw edges. 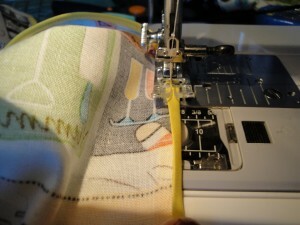 Then stitch a parallel row 1/4 inch in from the stitch you just made. Make sure to keep the tails long on your threads, because you’re going to pull on them to ruffle your fabric. Once you’ve made your ruffle as ruffly as you want it, stitch over the top of the ruffle to secure it. You could stop at step 6, or you could realize that you cut your fabric too narrow and it looks kind of stupid. You know how on Project Runway sometimes they screw up and then when they are explaining their final product they pretend like they intended to do that all along? So yeah, that’s what I did. I looked at the curtain in my window and I said “well, I didn’t really want to completely block that window anyway. Yeah! That’s it! I want TWO curtains so I can pull them apart! ” So I cut my curtain in half. 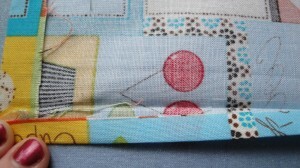 I have all manner of bias tape, so I just stitched that to the inside edge and now I have two curtains! And the satisfaction of having solved a problem! 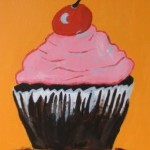 Through the magic of Persephone I just found this post! The curtains look super cute. I am a big sewer myself and recently made full-on drapes for the whole house.